I would recommend anyone to stay here. Very friendly and good accommodations. We would go again. Check in time is too late at 3:00 pm it should be earlier. 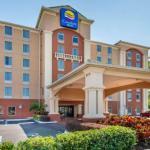 The six-story Comfort Inn International is a mile from Universal Studios and comprises 112 rooms designed for families on vacation but equally suited to the business traveler. The property is located on the International Drive tourist strip and is two miles from the Orange County Convention Center. Items included with the room rate are a deluxe continental breakfast, high-speed Internet access, local telephone calls, a newspaper on weekday mornings, parking and coffee available in the lobby 24/7. Area attractions include the Disney themes parks, numerous golf courses, Wet n Wild Orlando,SeaWorld, Universal City Walk entertainment complex, downtown Disney, the Florida Citrus Bowl and Amway Area, home of the Orlando Magic basketball team. All the rooms have a work desk with high-speed Internet access, multi-line telephone, television with cable news and movie channels, refrigerator, in-room safe, iron and ironing board, coffeemaker, alarm clock and a hairdryer. Some rooms have a microwave oven. The extended rooms with queen size sofa sleepers can accommodate six guests. Handicap accessible and non-smoking rooms are available. This hotel has an outdoor swimming pool. The complimentary breakfast is the only meal served here. Restaurants nearby include a Bennigans, Golden Corral, Fridays Front Row Sports Grill, and a Bahama Breeze. The 24-hour front desk has safe deposit boxes and information on area events and attractions. Other amenities include copy and fax machines available for guest use, a coin-operated laundry and ice and vending machines. Guests who stayed at this Comfort Inn said the rates were reasonable and the rooms were clean, well equipped and comfortable. Many liked the location on International Drive and within walking distance of dozens of restaurants and shops. The employees had lot of helpful hints about the best things to do and the best times to do them. Many clients say they will return to this inn on future visits to Orlando and had no problem recommending this property to others.